The Texas Corporations Section is the record book of every business entity and corporations that are or were incorporated in the state. Any entity, whether a Corporation, Limited Liability Company, Limited Company, Limited Liability Partnership or a Limited Partnership, registered or filed with the Secretary of State of Texas has its information stored in the Section for future reference. If you want help on finding a business entity registered with the Secretary of State of Texas, you can read our easy step-by-step procedure on using the Section's search tool. Important: If you want to search by Tax ID or File Number, it must be exact. If you want to search by Name, it must be specific (otherwise, you'll get a message telling you to narrow down your search terms). 1. The first step is to access the Texas business search page by clicking here. (see the screenshot below for reference). 2. For this business search form, they allow you to search by tax ID, entity name or by file number. For this example we will be searching by name. 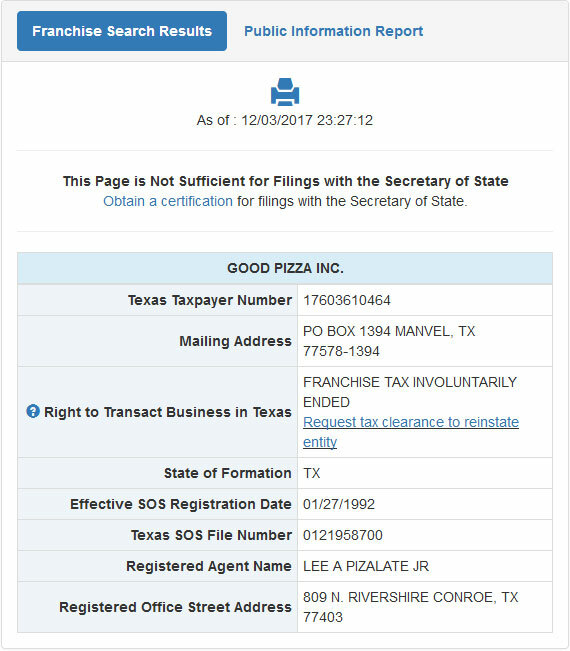 Go ahead and type "Good Pizza" in the "Entity Name" field. From htere you will need to click the "I'm not a robot" box to verify you are a human using this form. Once you have completed that step, then click the "Search" button, as shown in the screenshot below. 3. After you click the "Search" button, it will show you a list of results that match your search critera. They display the name, taxpayers ID and zip of each business entity that is listed. To view details for a business, click the "Details" button. (see the screenshot below for reference). 4. When you click the "Details" button to view the information for a business entity, a pop-up window will show. It will display the details including the taxpayer number, mailing address, filing date, agents name etc. You can reference the screenshot below. The Secretary of the State of Texas is one of the six members of the executive department of the state of Texas. The Secretary of State of Texas is appointed by the Governor of the State, and the appointment is confirmed by the State Senate. The current and the 111th Secretary of State of Texas is Rolando Pablos who was appointed by Greg Abbott. He was sworn into office in January 2017. The Secretary of State of Texas serves as the chief election officer and the chief protocol officer both for matters of the state and international matters. He also acts as the liaison for the Governor on Mexican and other border matters. The Texas Secretary of State handles business filings and statutory documents, including administering open meetings. 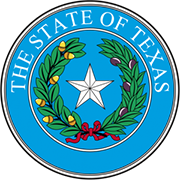 The Secretary of State of Texas is the custodian of the Great Seal of the State of Texas. He is authorized to certify and authenticate government documents by the use of this Seal. He looks after the public affairs and is the guardian of the public records and archives in the state. As one of the six executive officers of the state, he exercises a major role in the government of Texas.